My oldest has loved sidewalk chalk hopscotch since before he was two. He used to beg and beg his auntie and I to draw him new boards everyday. FamilyFun has some great variations on lots of sidewalk games here. I really like their Tic, Tac. . .Oh No version. 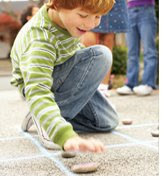 Tic-tac-toe is a simple classic, but in this driveway version, a single toss can bring about a reversal of fortune. 1. Setup: Mark out a 9-square tic-tac-toe grid and a toss line. Our grid was about 3 feet by 3 feet. Have each player use chalk to decorate 4 stones with his "team" color, and a 5th stone -- the "change" stone -- in a different color. 2. Players take turns tossing their stones, trying to get 3 in a row. If a player misses the board or lands in an occupied spot, he picks up his rock and his turn is over. 3. Once a game, each player can toss the change stone to try to take over an opponent's box. To be successful, he must land the stone on the targeted square. If he misses, he must pick up his stone, and his turn is over. The winner is the first player to get tic-tac-toe.